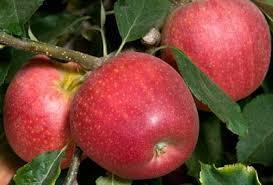 This variety produces an abundance of apples, and is known to have bending limbs from the weight. Fruit ripens mid-August to early September. Buying a pollinator with this product, such as Crab Apples or planting multiples will guarantee the tree to bear more fruit. Apple trees are easy and fun to grow. Apples are grown in most of the continental United States and around the world. Some apples require pollinators such as Crab Apple, and we carry only the best pollinators. Have you seen the price of apples lately? With our apple trees, you will quickly recoup the cost of your tree! We have apples that require very low chill hours, as well as apples that love extremely cold winters.